If you're looking for a genuine Blu-ray bargain on Amazon Prime Day... we have it for you. Even if you know nothing, like Jon Snow, it should be obvious that getting ALL of Game of Thrones seasons 1-7 on Blu-Ray AND Digital copy is a great idea. More than that, what if we told you it was only $74.99 - which is a whopping $155 reduction on the normal price? Yes, that's 67% off the regular price. This amazing deal is only available for the rest of Amazon Prime Day but... it's definitely going to sell out before that even happens. Check out the deal right here. 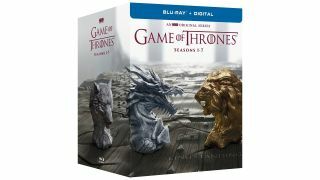 If you're new to Game of Thrones this is the perfect box to get you started, so you're all ready for the new season starting some time in 2019. Game of Thrones season 8 is likely to hit around summer, and it'll bring an end to the whole saga. If you already have a couple of seasons on DVD, you'll really notice the upgrade to Blu-ray, especially now that the picture and sound has been remastered for season 1, making it all up to the same standard as the later seasons. The deals will end when stock is gone, or midnight comes around. There have been so many Amazon Prime Day deals over the last couple of days, but they'll all come to an end at midnight today. And this Game of Thrones box set is easily one of the best we've seen. If you want a full rundown of all the deals, here are the best Amazon Prime Day 2018 game deals.